The three core values proclaimed in the mission statement of Witten/Herdecke University are freedom, truth and responsibility. Transferred to the Faculty of Management and Economics, this means that we offer excellent academic education with a focus on the conveyance of subject-specific expertise and the training of judgment and responsibility. Our graduates are the leaders of tomorrow, critical thinkers who assume entrepreneurial responsibility – be it in the private sector with a Bachelor or Master in “Management”, or at the interface between politics, business and society as graduates in “Philosophy, Politics and Economics”. As Germany’s first private university, Witten/Herdecke is a successful enterprise in itself. Entrepreneurial spirit is a core element of teaching and research at the UW/H Faculty of Management and Economics. Entrepreneurship and the related aspects of corporate governance, business foundation and start-up are issues addressed in seminars on a regular basis. A specific focus within the field is on family-owned businesses. The Witten Institute for Family Business (WIFU) is among Europe’s most renowned and research oriented institutes in the field. The Entrepreneurship Zentrum Witten (EZW) has been established to ensure the best possible practice transfer: it invites students to turn their start-up ideas into business reality, closely supervised and supported by academics and experts from practice. The education of future leaders is the explicit objective of studies in Witten. This undertaking includes a thorough understanding of modern leadership and organization concepts. The Reinhard Mohn Institute for Corporate Governance (RMI) funded by the Bertelsmann Foundation makes an important contribution towards this aim. The Faculty is conceptually oriented towards a holistic and interdisciplinary approach that addresses the real-life political, economic and social challenges. The complex issues of the 21st century are too complex to be successfully tackled though means and methods of a single discipline. The Witten Institute for Institutional Change (WIWA) pools the sociological and philosophical competences represented at our university with the aim to pursue interdisciplinary research based on real-world problems and thus contribute towards a better understanding of social, political and economic change and processes of reform. Close practice transfer in the field of sustainability is a major objective of activities at the Centre for Sustainable Corporate Leadership (ZNU) with a focus on the food industry, and at the Institute of Environmental Engineering and Management (IEEM) with a focus on water management. An ideal example of interdisciplinary research is the Dr. Hartmut Krafft-Zentrum. Researchers from the UW/H Faculties of Management and Economics and of Health jointly address issues related to health care and health politics. The Faculty of Management and Economics co-operates with many universities, enterprises and other organisations – within the region and across the world. 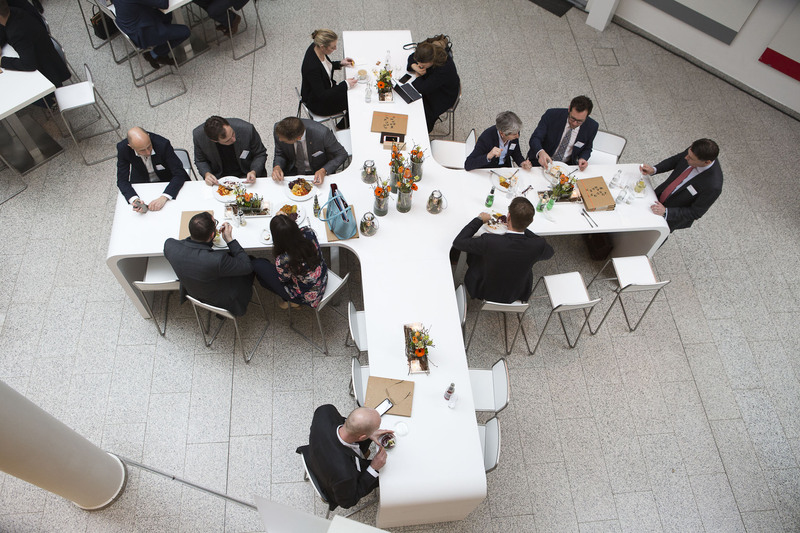 We are located in Witten, embedded in the Ruhr Valley and collaborate with about 70 family businesses (Witten Institute for Family Business - WIFU) and approximately 45 food industry companies (Center for Sustainable Leadership – ZNU). Renowned academic partners support our thematic foci, while our alumni are another very important element of our large network. They hold leadership positions in strong businesses worldwide.